We focus on educating our clients on proper form and technique. We believe in a well rounded strength, cardio, nutrition, and flexibility based program. We want you to stay motivated so that you can motivate someone else to become more healthy/fit. Born and raised in Memphis, tn. Carlos found his love for health and fitness at the age of 12 when He began participating in track and field. He graduated from univ. of Memphis with a bachelor's degree in the field of exercise science. Shortly following his graduation he moved to Houston, tx and received his certifications as a health & Fitness specialist, personal trainer, and strength & conditioning specialist through the organizations acsm, nsca, and ace. 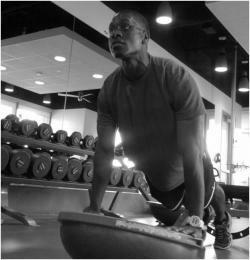 HE FOUNDED N IT 2WIN IT FITNESS IN 2010. "WHEN YOU FEEL YOU ARE READY TO GIVE UP, REMEMEBER THE REASON WHY YOU STARTED EXERCISING."